Honeymoon Offer – Stay at Anantara Veli for your honeymoon save up to 30% discount on the bed and breakfast rates. Please contact us for further details. Anantara Veli Resort and Spa Maldives is a magnificent adult’s only resort designed for relaxation and rejuvenation. Surrounded by translucent lagoons, escaping to Anantara Veli is heavenly. Gentle waves lap against the beach and the ocean breeze sways the foliage; creating a perfectly harmonious soundtrack to your stay. Restful days will be spent on the beach or laid back at the infinity pool. Tropical, coconut thatched bungalows are spacious and comfortable. Open and airy, endless views of the Ocean are to be savoured. Enjoy fiery red and rusty orange sun sets on your sun deck as you lounge with a fine wine or refreshing cocktail. Exuding luxurious comforts, each of the 67 bungalows is a heavenly exclusive retreat. Fine eateries serve international menus; sumptuously fresh meals are prepared with love and served on a beautiful plate. Sundari Ayurvedic Spa is a holistic sanctuary designed to relax guests and reach a balanced state. Rituals and ancient techniques are used to fulfil mind, body and soul and yoga sessions by the glistening ocean are awe inspiring. Escaping into a seventh heaven at Anantara Veli Resort and Spa, Maldives is a once in a lifetime experience. Honeymoon Offer – Stay at Anantara Veli for your honeymoon and save up to 30% discount on the bed and breakfast rates. Early Booking Offer – Enjoy up to 35% discount on bed and breakfast rates. New Years Special – Enjoy 7 nights for the price 5 or 4 nights for the price of 3. Infinity pool with infinite, shimmering views of the Indian Ocean. Soft white beaches are furnished with sun loungers and day beds, with the perfect shade from coconut thatched umbrellas. Lose yourself in a hammock as you surrender to the Maldivian way of life and relax. Cooking School – learn to cook regional dishes and delights from the Indian Ocean. Gracing the Indian Ocean is Anantara Veli Resort and Spa, Maldives. An adult’s only resort that nestles honeymooners into a tranquil paradise is the perfect backdrop for intimate and charming memories to be created. Azure waters glisten as the Maldivian sun beckons honeymooners to sit pool side. Breathtaking views of the Ocean are ultimately stunning and the exoticness of Anantara Veli, incredible. Housing only 67 thatched bungalows; Anantara Veli emanates privacy and exclusivity and earthy colours set the tone. Enjoying Maldivian scenery on your private sun deck is astounding and you and your loved one rest peacefully. Lavish designs focus on creature comforts; time spent in your bungalow will be serene. International menus are served throughout the resort, using local ingredients making each mouthful delightful. The infinity pool overlooks the Indian Ocean and guests are encouraged to go snorkelling and see the underwater marine life, Maldives being known as one of the best diving destinations in the world. Enjoy an Ayurvedic couple’s spa treatment, focussed on rejuvenating health and wellbeing using Ancient holistic techniques. 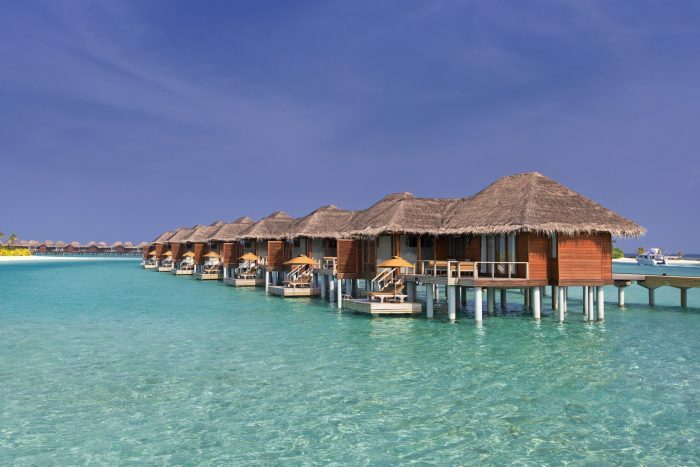 Every honeymoon should be treasured and the Anantara Veli Resort and Spa, Maldives is undoubtedly an impressive resort. 73 Degrees – Oceanfront all day dining in this airy restaurant is fulfilling when seeing the homemade breads, fresh fruits and tropical juices. An international menu is served. Dhoni – A poolside restaurant serving gourmet dishes. In the evening, enjoy aperitifs and refreshing cocktails as the aroma of shisha fills the air. Baan Huraa – Thai dining that is served in an authentic restaurant. Colourful dishes are served with generous helpings of jasmine rice and crackers. Origami – A classically stylish Japanese restaurant serving hand crafted sashimi, light sushi and tantalising teppanyaki. Dining by Design – a service offered by Anantara Veli Resort and Spa, to create personalised experiences for its deserving guests. Guests can choose the perfect menu, unforgettable location and setting for their romantic meal, be it on the beach or by the ocean or in-bungalow dining.